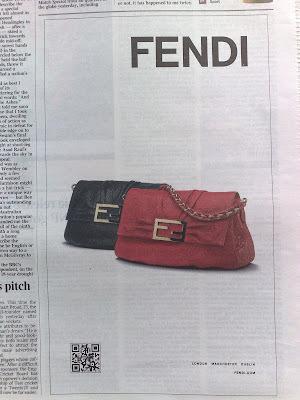 In today's Times newspaper Fendi (handbags) are running a print ad with a QR code on it. No other call to action mechanic, just a QR code. This is the first time I have seen this in a UK newspaper - another sign that QR codes on traditional media executions are becoming more ubiquitous? Hi Matt, thanks for the comment and the link. I was introduced to QR codes through a presentation on the Japanese mobile market and shortly afterwards the Sun published their feature. I pulled it all together in a post here. They maybe haven't had the impact initially envisaged but signs are that QR codes are making progress and featuring on an ad in the Times is a definite sign of increasing mainstream nature of QR codes. I am working for a English newspaper company in Asia. I am exploring the possibility of using QR code to tackle the dwindling circulation figure. Would like to know what is your experience on this?